Now you can easily find out what is the Screen Resolution of your Windows Computer with the Screen Resolution Software Utility. The Software Utility is a tiny application and is free to download and use. Given below screenshot displays Screen Resolution utility in action displaying resolution of a Windows 7 computer running on 1 monitor and with a resolution of 1920 X 1080 . Knowing Screen Resolution can be really handy in many cases. Let’s say you want to download a wallpaper from internet and the site allows you to download wallpaper of many screen resolutions, then in case you do know of your screen resolution, then you can select the best wallpaper accordingly and download and use the wallpaper. Whether you are running single or multiple monitor windows computer, this screen resolution software will tell you the total width and height of your virtual desktop area available. In case you are using dual or multiple monitors, then the Active Monitors field of the software will tell your how many monitors are actively connected in extended mode. However if you are using dual or multiple monitors in clone mode on a windows computer, the Active Monitor field will display only 1 and will not display how many physical monitors are connected in clone mode. The same applies when you are using multiple monitors using a KVM switch, the Screen Resolution Software Utility will report only the number of monitors that are actively connected in extended mode to the CPU. This Screen Resolution Software Application is totally free to use and download. There are no trial limitations or any reminder pop ups in the software and can be used as long as you want to use it. Download and find out the Screen Resolution of your Windows Computer now. 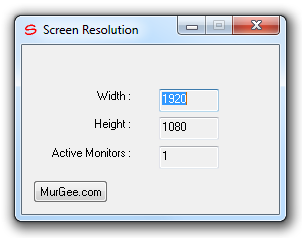 In case you do change Screen Resolution or enable / disable monitors while this software utility is running, it will automatically display you the effective screen resolution and number of monitors connected to your windows computer. In case you are using Dual Monitors or even Multiple Monitors connected to your Windows Computer, then MurGeeMon Software utility might be of interest to you which allows fine control over connected monitors and other attributes of desktop and running applications.